Today's Masculinity Monday comes to us from guest writer Trey Stewart. Trey's previous posts for us include SFC Fridays on Nimah and Raina Amin and Alex Parrish from Quantico, as well as a recent post on the importance of The Flash's Joe West. In my first ever post for Masculinity Monday I talked about (non)toxic masculinity as reflected in the three main male characters from Star Trek: The Original Series. Today, I am shifting gears to the Next Generation era to discuss Klingon masculinity as it is embodied in Worf (Michael Dorn). 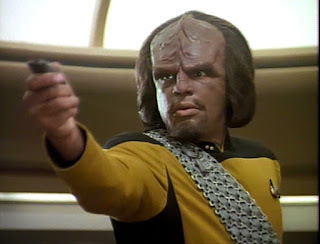 Since his debut in the first episode of Star Trek: The Next Generation, Worf has been a space-time explorer, diplomat, and influential figure in Klingon politics. Worf has been described as the ultimate Klingon. But he's also been a fascinating character to consider as an example of how to live in a hyper-masculine society. And on top of all of this, he appears to our eyes to be an African-American man, despite the science fiction conceit that Klingons don't adhere to human concepts of race. So here we have a large, physically imposing black man from an alien warrior race acting out and thinking through the ramifications of modern masculinity. I think you can see where we're going with this. Before I share what makes Worf an interesting portrayal of masculinity, though, I should probably give you a bit of background on the Klingons in case you aren’t as obsessed with Star Trek as I am. 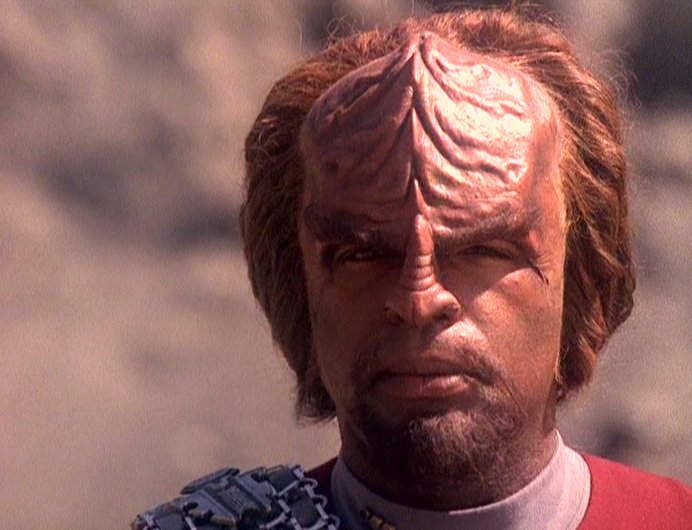 Basically, it's interesting to look at Worf, the ultimate Klingon, as an expression of masculinity because Klingon society is in essence a big bubbling stew of traditional masculine stereotypes. Klingons are known as the prototypical proud warrior race. They are barbaric and have an aversion to both bathing and doctors. Klingon gender norms dictate that everyone grows up to be a warrior. Nonetheless, Klingon society is highly patriarchal. The Star Trek franchise covers an in-universe period of 228 years of contact with Klingons. During this period of fake history in a made up story, the Klingon Empire was somewhat in decline. A few decades before humans made first contact with the Klingons, the warrior caste gained control of Klingon society. This fact shapes both Star Trek humanity’s interaction with Klingons and Worf’s upbringing as a Klingon. So. Prior to Worf’s introduction, Star Trek had not done much to explore Klingon culture. Klingons were basically communists in space. They served in the original series, which aired in the commie-phobic 1960s, as a sort of catch-all villain. They were meant to be threatening and menacing and uncomplicatedly bad, a convenient fall guy who was always stirring the pot. But when Star Trek: The Next Generation came around in the 1990s, the Cold War was over and people were willing to consider a more compassionate and comprehensive view of Klingon culture. Hence how Worf became a part of the crew and the show took on a long storyline about the integration of the Klingon Empire into the Federation. I know. That's a lot of nerd. So Worf was born on the Klingon homeworld. At age five, he moved to the Khitomer colony. Khitomer had been the site of the signing of the treaty that made the Federation and the Klingons allies. Shortly after Worf moved to Khitomer the colony is attacked by aliens. Subsequently, humans raised him. This means that our hero is a child of cross-culturalism, and it also means that for all that Worf fits the masculinity prescribed by Klingon culture, he wasn't entirely raised in it. And that's important. When we meet Worf aboard the Enterprise at the start of Star Trek: The Next Generation, then, he has spent most of his life among humans. His parents had tried to honor his Klingon culture, but Worf gives the impression of having something to prove. At this point he is a junior bridge officer. He spends most episodes just suggesting that the Captain should be more aggressive in dealing with his problems. But Worf is not just a warrior. Even in his early experiences aboard the Enterprise we see that Klingons, and therefore Worf, have a code of ethics centering on honor. 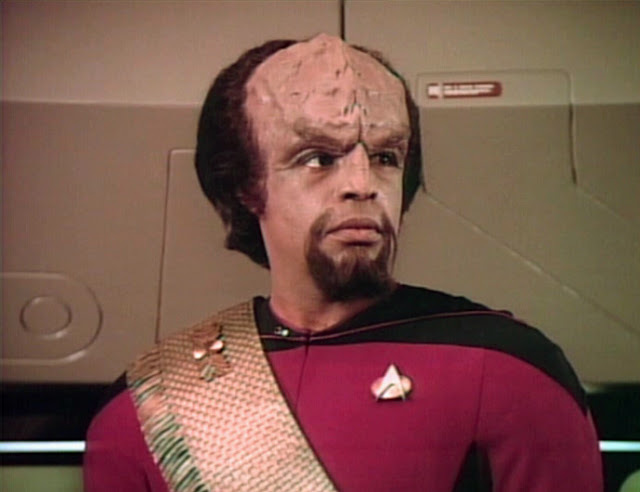 Early in his time on the Enterprise, the best way to describe Worf is insecure. He doesn’t seem quite confident that he is a real Klingon and this affects his sense of his own masculinity. Worf’s first step toward becoming his own man occurs when the Enterprise makes contact with a Klingon sleeper ship (the crew had been in suspended animation for decades) that was launched when the Federation and the Klingons were still at war. At first violence seems like the only way to keep the Klingons from attacking the Enterprise and nearby Federation outposts. Surprisingly then, Worf is the one to diffuse this simmering threat in a way that is both completely non-violent and also pretty tricky. He comes up with a plan in which he and the half-Klingon emissary that had been sent to help resolve the situation pose as the captain and first officer of the Enterprise. In this temporary position of command, Worf is able to talk the Klingons out of attacking. The emissary then supervises the Klingons' assimilation to their new time period. By showing these Klingons that a fellow Klingon now captains a ship for the Federation, he is able to grant them representation and a feeling of acceptance, making them able to put down their weapons and end the war. Worf’s influential role in Klingon politics begins to evolve here, and it continues when a rival Klingon, Duras, accuses Worf’s father of assisting the aliens that attacked Khitomer. In the process of fighting these allegations, Worf exposes a cover up of the true traitor’s identity. 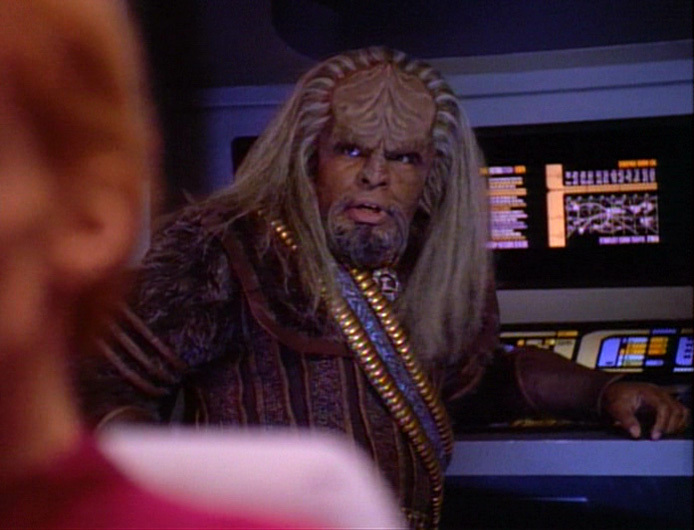 In other words, Worf discovers that his fellow Klingons were not as honorable as they seemed. It's a hard blow for a man who has built his entire life on believing the best about his race. Suddenly Worf is forced to accept that while there is a lot of good in Klingon culture, it's not all good either. And if he wants to be an honorable man, that's great, but he's going to have to decide what honor means for himself. While violent, Worf’s involvement in Klingon politics is motivated by a sense of honor as an abstract moral principle. To a degree, Worf’s actions can be seen as steering Klingon society back to the way it was before humans made contact with the Klingons. By doing this, he attempts to right the toxic elements that have crept into their culture without allowing the society to go back to its old isolationist ways. 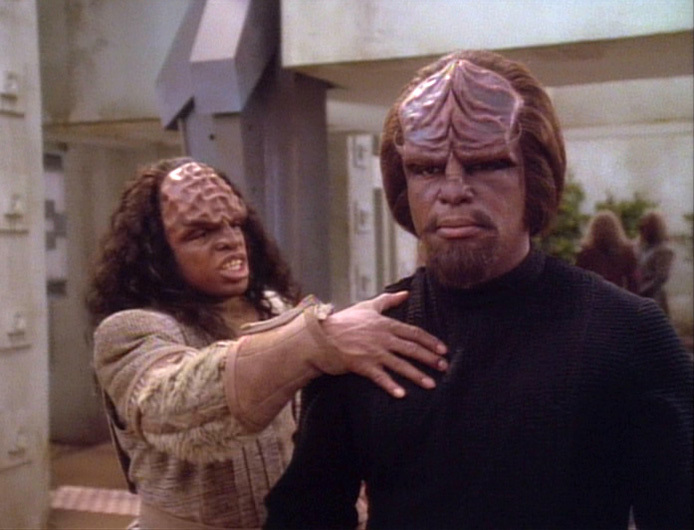 Worf’s life provides some insight into confronting toxic masculinity both within a society and from the outside. During much of Worf’s life, Klingons were more focused on maintaining a reputation of strength than the ethical demands of honor. As a result, the Klingons suffered through a civil war, engaged in a needless conflict with a neighboring power, and abandoned longstanding alliances. Klingon masculinity during this period was both unhealthy and similar to the “traditional” view of masculinity in contemporary US society. While he doesn't talk much in terms of masculinity exactly, Worf’s status as an insider in Klingon culture makes him well positioned to confront its toxic elements. As a man also raised outside the society though, he's better able to identify what those toxic elements actually are. In a word, Klingon masculinity is fatalistic. If I were Worf’s commanding officer, I could see myself having some direct but respectful conversations with him about matters such as women’s roles, the value of medical care for a warrior, and the drawbacks of ritual suicide. Worf has contemplated suicide on at least one occasion. It's clear that Worf has some ideas and cultural beliefs that don't jibe with our ideas of what makes for a healthy society. But it's not all bad either. That's what's so interesting about Worf. Because he is able to pick and choose through Klingon culture to find what is worth preserving, we get to see that there really is value there. Sort of like how we, in picking and choosing what to keep of American traditional masculinity, find lots of things not worth losing just because there are other things we need to cut out. 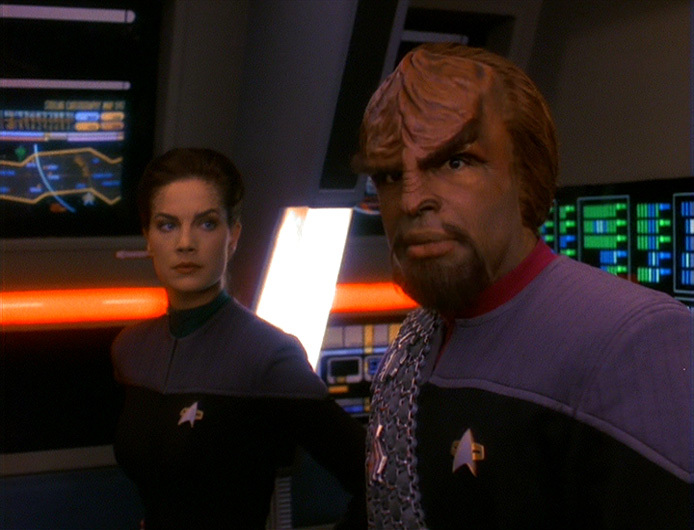 It's also important to think of Worf as a character with his race worked in. Like I said above, the color of Worf's skin doesn't matter in the story of the show as Klingon's don't ascribe to human racial differences, but it does matter in the context of the show being on television. Just like Worf's representation as a "captain" in the Federation helped those stranded Klingons assimilate, seeing him on the television screen every week helped African-American kids see themselves reflected in the culture. Worf's struggles to understand and appreciate Klingon culture, as well as his struggles to fit in on the starship, find romantic love, and navigate his own past and family history, all make for a compelling story about redemptive masculinity. But they're also all stories that feel familiar to African-American audiences watching this strange, gruff, alien man working through his problems. Worf matters because he represents so much, and he's worth celebrating because he doesn't just sit in this stew of complexity. He gets up and makes his own understanding of honor. He learns how to be a good man and a good Klingon and how to be both at once. Thanks to the reboot, we don’t know much about Worf’s future, but in the old timeline we know that he has a good life. Following his time as an ambassador, Worf serves on the Enterprise-E, the successor ship to the one shown in Star Trek: The Next Generation. Beyond that, depending on the timeline, Worf is either a general, colonial governor, or member of the Klingon High Council. Whatever he is doing, he is serving with honor. Trey Stewart has his PhD in Educational Psychology from the University of Alabama. He recently started his own education research consulting/tutoring business. This is incredible. I read your whole post. It is really very good. I didn't know this fact before. Thanks for the share. Keep it up.